As the only Christian public health school in Southeast, Samford University’s School of Public Health prepares graduates who are competent and compassionate, ready to address the challenges that face the world today. Recently, the school hosted an interprofessional poverty simulation with the purpose of providing students a glimpse at a perspective they don’t normally see. Before the simulation began, students were randomly assigned to a family and given a specific role within it—roles such as a child, parent or grandparent. Each 15-minute increment represented one week, and over the course of an hour, or one month, students were faced with challenging scenarios. “What happens is, each role has a task they have to complete,” said Rachel Casiday, associate professor for the School of Public Health. “Children have to go to school. Adults have to go to work, or if they are unemployed, they have to search for a job. Then in the remaining time, they have to complete certain needs, like buying groceries and paying bills. If these tasks cannot be completed, consequences occur." As the simulation progressed, the limited time began to feel more pressing, as students ran around the room, working to accomplish each task. Once the simulation was complete, students divided into groups to debrief. 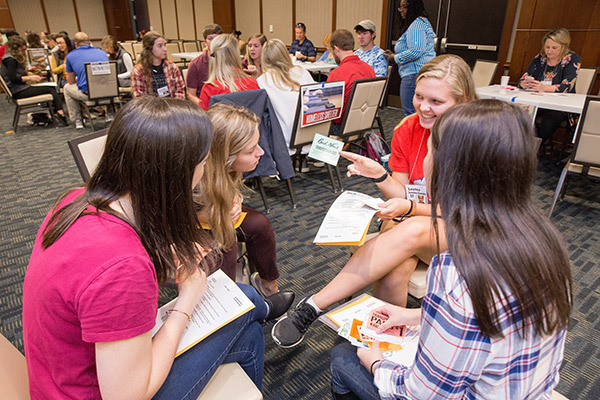 The simulation involved more than 150 students and faculty members from the College of Health Sciences’ four schools, establishing an interprofessional experience that the School of Public Health hopes will make a lasting impact as students prepare for careers in health care. “The simulation provided insight into why so many health disparities exist in impoverished areas as there is so little access or time for preventative measures like healthy foods and exercising,” said Sarah Waller, a senior public health major.